Excuse me, I wanted to see about opening a small business checking account. Excuse me. Do you know where the bathroom is? When you pronounce "excuse me", it can sound like "'Scuze me"
Excuse me, Ma'am. You dropped this on the sidewalk back there. But since these titles are actually thought to be impolite in some areas, it's best to listen first to see if other people around you are using them. Hi Jen. I wanted to see if you'd like to come out with Emma and I and some friends of ours to a show next week. Yes, I just wanted to verify that my payment has been received? Note that this is in past tense: you say "I wanted to ___" instead of "I want to ___". There's no grammatical reason for making it past tense; it just makes your sentence sound more polite. When you say it this way, it sounds like an explanation for why you're calling, why you're visiting, etc. People use this phrase to talk about doing something that they haven't thought much about. The activity is usually something small and not that difficult. Kathy, could you see about getting me some kind of filing cabinet for my office? I'll see about getting us some dinner. When you use this phrase, you sound uncertain whether you'll be able to succeed at the action that you're talking about. When you "have an account" with a bank or a company, it means that there has been a customer relationship set up between you and the company. You and the company are able to pay money back and forth through this "account". Your bank account is one example. When you put money into your bank account, the bank keeps a record of how much money it owes you. I'd like to open an account, please. A "small business checking account" is a type of bank account. Checking accounts are for money that you need to spend. You can take money out by writing checks, or by withdrawing money from an ATM. Savings accounts are for saving money. You can earn more interest for the money that's in a savings account. You can take your money out of savings, but the bank may have restrictions on how often you can move money in and out of savings. 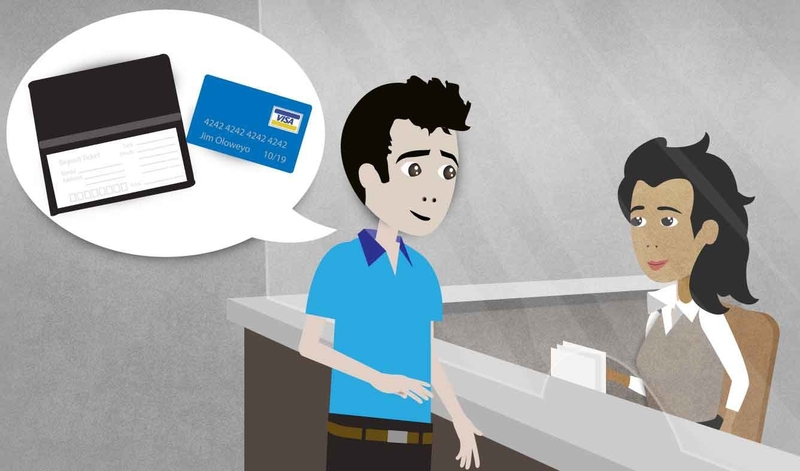 Banks offer "small business checking accounts" to businesses. These accounts have different rules than personal bank accounts.